Cheesecakes - a dish of delicious yet simple to prepare, and because it is often served for Breakfast. 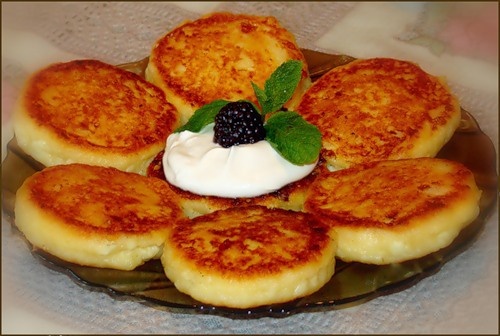 Pancakes are eaten with jam, honey, condensed milk, sour cream. Although cook cheesecakes is not too difficult, so they came out juicy, lush and soft, you need to know some nuances and secrets. It is quite natural that for the preparation of delicious food products must only be of good quality. The basis for cheesecakes - cottage cheese. And because of to this product to meet such requirements: it must be fresh, not very sour, not fat, but not too greasy. The perfect fat content for cheese - 7 to 18 percent. The texture of the cheese should be free of grains that is homogeneous. If the cheese somewhat dry, fixing this is easy: you need to dilute it with milk, yogurt or sour cream. If the curd is sour, you to mask this error will have unnecessary added sugar that is harmful for overall health and figure. And the taste of the cheese will become inconspicuous. If the cheese is too wet, it is better to get rid of serum with the help of strainer or cheesecloth, because otherwise we'll have to add a lot of flour or semolina, and it will make the dish just rubber. Curd for cheesecakes, it is desirable to wipe through a sieve, in order that its consistency was uniform. It is important to ensure that the pancakes turned out delicious. Juicy will be the only pancakes with a good texture. Eggs - an essential ingredient for cheesecakes, no the recipe is not complete without them, because without them, the cheesecakes will simply collapse. Only the surplus is also not encouraged due to the possibility of obtaining a hard test. If you want cheesecakes were rich and beautiful colors, then you can add only the egg yolks. Pancakes should not be thick and large diameter not only that they are better cooked, but also for convenience when turning. In order to form cheesecakes optimum size, the dough should scoop a tablespoon and roll small washers. Below the crust of the cheesecake was zolotisto-petite, need to fry them in a pan with non-stick coating. The bottom of the pan should be thick. For frying you need to use high-quality vegetable oil. Pan before cooking well heats up. To cheesecakes were baked, the pan cover domed lid. You want to cook only on low heat, then the cheese will not burn and bakes well. In a large bowl mix a pack of cheese, 1 egg, 2 tablespoons semolina, 1 tablespoon flour and 1 tablespoon of sour cream, salt, sugar and vanilla to taste. Let stand the dough for half an hour. Using a tablespoon divide the dough into balls and form them into washers, their thickness must not be more than two inches. You preheat the pan and spread it obalanya in flour cheesecake. Fry over medium heat until browned. Cheesecakes are served as hot and cold.